October of 2017 marked my five-year anniversary as president of Midwestern Seminary and, thus, five years of leading Midwestern Seminary For the Church. In concert with this milestone, we at Midwestern Seminary launched a new tradition, the faculty lecture. I had the privilege of presenting the inaugural address, entitled “For the Church: A Five-Year Appraisal.” This article, adapted from my faculty address, is the second installment in a three-part series. You can access the first installment here. What Does it Mean to be For the Church? What does it mean to be For the Church? It means so much, but from 30,000 feet it simple means for the church is our mission. It is why we exist, what we exist for; how we orient ourselves and our institutional goals; how we think of ourselves and project ourselves; and how we make institutional decisions. Most especially, For the Church is seen through the faculty and the curriculum – who teaches, how we teach, and what we teach. How we teach is incredibly important. A seminary, in its final analysis, is not defined by the buildings it does or does not have, or the president it does or does not have. It is defined by the students it does or does not have, and the men and women it does or does not have teaching them. It makes all the difference to have professors who teach with that vision on the forefront of their minds. Thus, church history is not just about memorizing names and dates, it is about seeing, knowing, and reveling in God’s faithfulness to his church for 2,000 years. Theology is not about deciphering how many angels can dance on the head of a needle, it is about equipping the people of God for faithful doctrine in the church. Missions is not merely about deploying missionaries, it is about understanding that missionaries are sent to reach the lost for Christ and to see them brought into healthy churches so that the church domestic is indeed the church global. Apologetics is not about merely crafting arguments, it is about equipping our people to be able to answer the questions so that the church might rightly defend the faith. Moreover, biblical studies – Old Testament and New Testament – is not merely about seeing who can memorize the most vocabulary. It is about equipping our students in the Scriptures so that the people of God may be similarly equipped. Therefore, in every class, the professors must be able to draw a line from their subject matter to the local church. Most especially, For the Church is seen in the hires we make. We ask ourselves, colloquially, when we consider hiring someone, are they “For the Churchy”? Do they want to serve the church? Do they see their primary calling as training pastors and ministers for the local church? 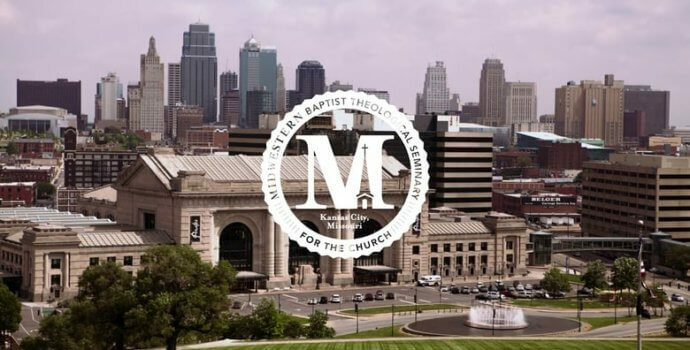 If their first commitment is to the broader academy, then they are not going to be a good fit at Midwestern Seminary. Finally, For the Church touches on the campus culture we seek to foster. From the events we hold to the guests we host, everything we do we want to filter through the question: does it enable us to better serve the church? For Midwestern seminary, this is the ultimate question. Therefore, we reflect, under this vision, what has God accomplished these past five years? First, For the Church has taken root. Over the past five years, God has chosen to bless our work in material and immaterial ways. For the Church has taken root and that is no small achievement. It has gone from being my vision to being our vision to being the vision. This is no small achievement because many seminaries have no idea why they exist. I do not mean that as a statement of condescension, I mean that as a statement of fact. Many seminaries cobble together as many classes as they can, kind of like a shopping mall, and try to get enough people coming through the doors so that they can pay their bills. When that happens, the mission is diluted. So much so that the ministry and the emphases of the seminary quickly transitions to be focused on nothing. At Midwestern Seminary, we sought to work backward and say, “We are going to build an institution devoted to the local church and then we will figure out who will come around that vision.” God has blessed us by sending us more students than we ever imagined. In fact, over the past several years we’ve been recognized by the Association of Theological Schools as one of the fastest growing seminaries in North America. When ATS was putting the story together, they called me to inquire of our growth. My interviewer had no idea what we were doing and not much of an idea about theological education proper. She asked me about our growth and said, “What have you done? Have you expanded your advertising? Have you expanded your admissions office?” All her questions were programmatic. I said, “Ma’am, we have sought to bring excellence to every area of the campus, but to understand our growth you have to understand that it is not about new programs or new hires, but rather our vision. We exist for the local church and the vision is resonating broadly within our constituency, the Southern Baptist Convention.” So, God has blessed, and For the Church has taken root. Second, God has given us a collection of faculty and staff who share our vision. God is calling extremely gifted and faithful people to come here. It is often underestimated how massive it is when a person who has four or five young kids uproots and moves 400 miles, 800 miles, or across the ocean to come to a new place of service. That is a considerable upheaval and no one, in his or her right mind, would do that casually. God has given us such men and women, servants of extreme gifting who serve with a pronounced sense of calling. I am extremely grateful for all of my colleagues at Midwestern Seminary, both those who preceded me and those who have come in more recent years, who are cheerfully laboring For the Church. Third, God has given us a student body who is choosing Midwestern because of the vision. When enrollment is talked about, it primarily has to do with numbers. But if mere numbers are the focus, the bigger issue is overlooked. The issue in seminary is not how many students you have, it is the quality of students you have. What are they coming to do? How clear is God’s calling on their life? Why are they coming to be trained? Fourth, as already referenced, God has given us a surging enrollment. When I came to Midwestern in 2012, I dreamt of an enrollment of 2,000 students. If I’m honest, I did not think we could necessarily get there. There was nothing empirical that suggested we could, given where higher education and seminaries were trending. The 2,000 number was, frankly, in my mind a goal that if we hit I thought we could have a sustainable business model. This was the ideal student population I hoped to have to be able to support the staff and faculty. God has done so much more than that. He’s done more than any of us could have thought or asked. Fifth, God has given Midwestern a robust and sustainable business model. This should not be taken lightly. If an administration spends all its time doing crisis fundraising, which is a losing proposition, they are unable to do the things that matter most – investing in the team and, thus, investing in the students. Additionally, it matters because we want to keep tuition low for students, to care for faculty and staff, and to be able to recruit and retain the best faculty and staff. All of these things take financial resources. Sixth, over the past five years, God has given us a convention of churches who look to us with growing confidence. In a recent video, I was proud to see multiple men talking about how churches are looking to our seminary with confidence. They are proud of who we are, and they are proud of what we are producing. The day that the denomination loses confidence in its seminary, is the day that seminary begins to go out of business. Finally, God has given us a renewed spirit on our campus. It is one of unity, purpose, cheerfulness, comradery, and mission. This, indeed, is a joy-filled place to serve. Like our other blessings, we do not take this for granted. I am reminded of the great line from Winston Churchill in the aftermath of the miracle at Dunkirk where he famously declared, “Wars are not won by evacuations.” Similarly, great institutions are not built by living in the past. We forget the past to our own peril, but we live in the past to our own regret. God has given Midwestern a good five years. What is it like for God to give Midwestern a good five decades? What does it mean going forward? How do we rightly steward our gains? How do we project forward and outward our mission and ministry? Next week, in the third and final installment of this series, we will explore the future of For the Church.